A man named Sukurat Idowu, 45, has been arrested by the Lagos state police for brutalizing his 5 year old daughter at their home in Ikotun. The suspect is currently being held by the command for the offence of child abuse. 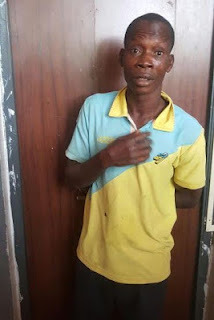 He was arrested after a concerned neighbour who witnessed the battery reported the case at Ikotun division. 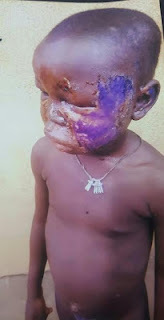 The neighbour narrated to the police how the suspect sent the victim to go and dispose of the content of a potty in the latrine and the child fell into the gutter, an occurrence which infuriated the father and made him to beat her mercilessly with a hot iron. The suspect was subsequently arrested and the victim rescued. She is currently undergoing treatment in the hospital while the suspect is undergoing interrogation with the gender unit of the command. Effort is on to trace the mother of the victim who has been separated from the father since she was two years.